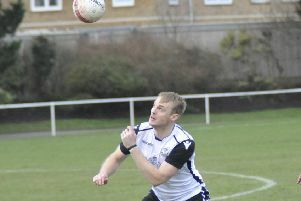 Bexhill United Football Club moved into the top two following another convincing victory on Saturday. The Pirates netted twice in either half to triumph 4-0 at home to bottom-of-the-table Worthing United in Southern Combination League Division One. Bexhill manager Ryan Light was in London for the weekend, so Mason Ponti took the side on the day, ably assisted by Chris Rea. Light picked the team in advance and was in telephone contact at half time as he tried to pull the strings from the theatre. He said: “It was another good win and another game ticked off. With (fellow high-flyers) Steyning not playing, it was important we got points on the board. Especially being a home game against a team we should beat, it was important we got the job done. On a pitch which had dried out remarkably well following all the rain and sleet of the previous day, Bexhill didn’t really click during the first half yet still enjoyed a two-goal cushion at the break. Jack Shonk and Sammy Bunn had sights of goal in the opening 10 minutes before Nathan Lopez was forced off with the quadricep injury he suffered during the previous weekend’s 6-0 thrashing of Billingshurst. Connor Robertson came on in his place. Shonk, playing as the central striker in the absence of Drew Greenall, gave Bexhill a 17th minute lead. Shonk danced his way into the box and feigned to shoot a couple of times before slotting past the goalkeeper into the corner of the net. The same player doubled Bexhill’s advantage from the penalty spot on the stroke of half time after Kyle Holden was spectacularly taken out at the end of a trademark mazy run into the box. Bexhill stepped up a level during a comfortable second half in which they dominated possession and goalkeeper Dan Rose was untested. They went three-up in the 55th minute through a great left-footed strike by Robertson from the edge of the box which flew into the corner of the net for his first goal of the season. Sammy Bunn stepped inside a Worthing defender and shot just wide of the far post at the end of a good move. The same player then sent a free kick just over. Zack McEniry, back in a Bexhill shirt for the first time in a while, poked just wide from a low cross by fellow substitute Kion Parchmont. Bexhill wrapped things up with a fourth goal in the 87th minute. McEniry got his foot to Jamie Bunn’s free kick into the Worthing box and Sammy Bunn slotted home. Bexhill: Rose; Holden, McGuigan, McFarlane, Lopez (Robertson); J Bunn, S. Bunn, Foster; Gouet (McEniry 63), Shonk, McLean (Parchmont 75). Southern Combination League Division One top half standings (played-points): 1 Alfold 22-54 (+40 goal difference), 2 BEXHILL UNITED 23-53 (+53), 3 Steyning Town 21-53 (+36), 4 AFC Varndeanians 21-42 (+26), 5 Selsey 22-41 (+22), 6 Hailsham Town 22-33 (+8), 7 Littlehampton Town 22-31 (+1), 8 Wick 22-31 (-6), 9 Seaford Town 23-30 (-6).